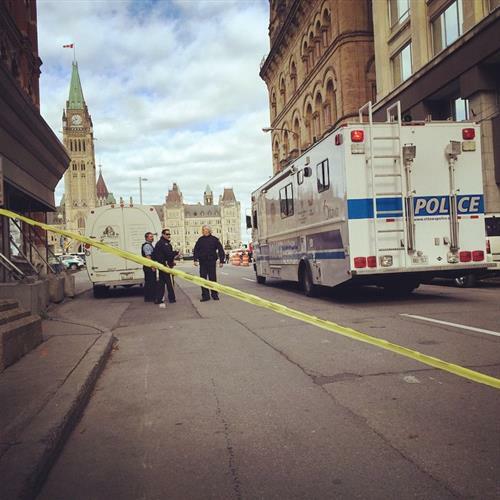 Breaking news from Ottawa, Canada, where two shootings in and around the Parliament building left at least two dead. Watch chaos inside the Parliament Building as guards react to shots fired. 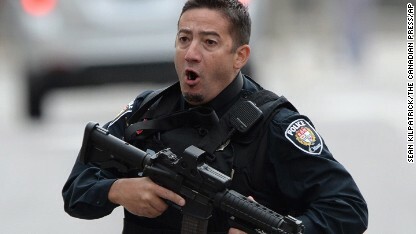 Two shootings rocked the heart of Canada's capital, Ottawa, today. 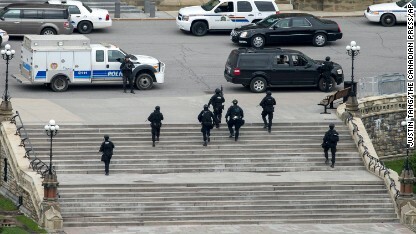 A Canadian soldier was fatally shot while guarding the National War Memorial and there was also gunfire inside the Parliament Building. At least one suspect is dead; no one else is in custody, according to police. Here's our main news story about the shooting and here's coverage from our Canadian partners, CBC and CTV. Thanks to CNN's Dana Ford, Jason Hanna and Rachel Clarke for blogging this fast-moving event. CNN's Noah Gray spoke with Matthew Millar, Parliamentary bureau chief, Vancouver Observer. He was inside and above where the memorial shooting took place. He has evacuated and is currently sheltering. He tweeted vines and gave CNN permission to use. 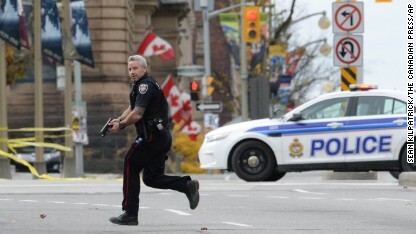 Here's video from the Globe and Mail showing frantic scenes as guards react to the sound of shots. 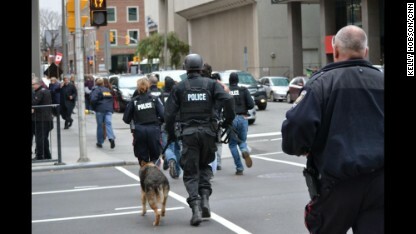 The shootings in Ottawa have put NORAD on alert. The North American Aerospace Defense Command, the U.S.-Canada military organization that coordinates air defense for the continent, has increased the number of planes that would ready to respond should they need to, CNN's Barbara Starr reports. “We have taken appropriate measures to ensure that NORAD is postured to respond quickly if the ongoing situation in Ottawa should include any effect on aviation,” U.S. Navy capt. Jeff Davis, a NORAD spokesman, said. 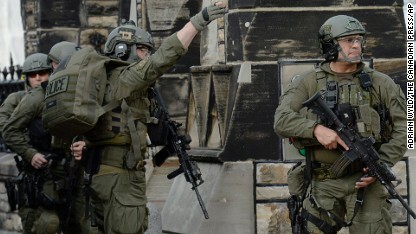 Some people still are locked inside their offices in buildings on Parliament Hill, though police are searching the area and releasing people as they go, Canadian lawmaker John McKay told CNN. Members of McKay's office are among those who still are locked in a Parliament Hill building, awaiting release, McKay said. McKay is not, having long ago been escorted out of the Parliament building. At a press briefing moments ago, police weren't clear about whether they believe a suspect was on the loose. They have said that one suspect is dead. Members of the Canadian Parliament are hailing Kevin Vickers, the sergeant-at-arms, for his actions helping to stop a gunman this morning. MPs and Hill staff owe their safety, even lives, to Sergeant at Arms Kevin Vickers who shot attacker just outside the MPs' caucus rooms. Here's a little more about Vickers, from CNN's Rosa Flores. In countries with parliaments such as Canada and the United Kingdom, the sergeant at arms is a person with a ceremonial role but also the person who is in charge of security in the building. Canadian Prime Minister Stephen Harper had been scheduled to meet with Pakistani activist and recent Nobel Peace Prize laureate Malala Yousafzai on Wednesday. The shootings scratched that plan. Yousafzai, herself a shooting victim, was due to receive honorary Canadian citizenship, a rare honor, according to Harper’s office. The Vancouver Observer's Matthew Millar was in a hallway above the gunfire in Parliament. "At first it sounded not unlike a pallet falling on the ground. There’s a lot of construction going on, but very quickly followed by several shouts and, by my count, about three dozen rounds of handgun fire," he said. "We were very concerned. We didn’t know if at the time that the shooter was addressed. We were still hearing gunshots while we were barricaded in our office, and certainly had concerns for our safety," Millar told CNN. That does it for the live blog today. Thank you for reading and please continue to check CNN.com for all the latest on this important story.